Peter and I got over to the boat in Cowes mid morning to get a few jobs done and so I could dive under and clean the bottom, the first of this season and well over due. I hadn't fancied it earlier as the water hadn't warmed up sufficiently. There was plenty of the usual brown sediment to remove and some serious fouling on the sunny side of the boat. This took an hour including freeing up a slightly sticky folding prop. 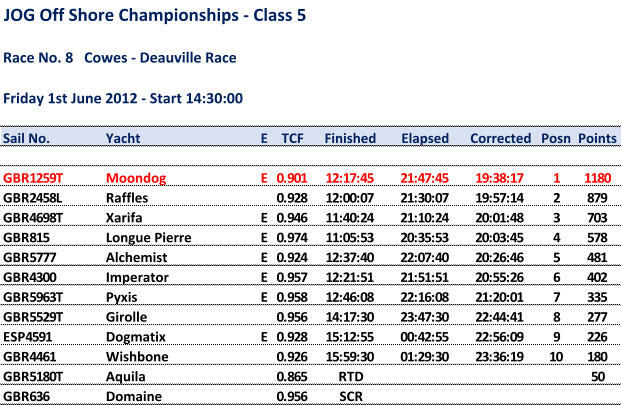 Two good reasons for our poor showing in the Yarmouth race, possibly some poor sailing contributed as well! The Deauville race start line was long and fairly crowded. Only two handed this time as Robin was away on family duty and holiday in South Africa. We opted for the middle of the line for tide and not too far from the pin which was favoured for wind angle. Our start was reasonable with the kite up and drawing quickly and in a clear wind lane which was so important given we were next to lowest rater. Alchemist was in a similar position to us but slightly further down the line and Raffles ahead having had what looked to be a superb start. Bigger boats started causing problems and it was a test of nerve to keep clear wind and sail where we wanted to. Down the eastern Solent the wind came further aft causing many to gybe over toward the mainland side to keep a good wind angle. We eventually gybed out and within 100yds saw the wind fill in close to the Island, those there steamed off on a beam reach, notably benefiting were Raffles, Xarifa, Imperator and Aquila. We slowly made our way back to that side of the course and were probably in the second tier of boats to benefit from the new breeze. Those that had gone a long way towards the mainland were missing out big time! Approaching the forts the wind backed further and the kite came down for white sailing. Through the forts we kept to the edge of the Nab channel, to benefit from the stronger helping tide there, before settling onto a sheets just eased tight reach on about 160 degrees magnetic, which was our selected course to steer on a light wind starboard tack. Sometime after leaving the Nab Tower area Longue Pierre came passed, presumably having been caught out on the mainland side of the eastern Solent. From there until midnight the wind eased and at times we were down to just under two knots of boat speed. With the expectation of the wind backing through SE eventually to East we were looking hard for the wind changing. In the end we tacked onto port around 00:30 but soon tacked back as the new tack was not yet the making one. We tried again at 01:30 and found the wind had shifted enough to give us 190 degrees to steer and this quickly improved until we were on our preferred port tack course of 150 degrees. As dawn came we started to see yachts all around us, many to the west, a similar number to the east and plenty bringing up the rear, things were looking good for the joint smallest boat in the race. Around 20 miles from the finish we spotted Raffles coming in from the east under spinnaker and not far ahead, another good omen. The wind freed to around 60 degrees apparent so we hoisted the asymmetric and flew this for a time until around 12 miles out when the wind headed and we went dead close hauled for the rest of the race to the finish putting in a couple of short tacks to round the finish buoy. 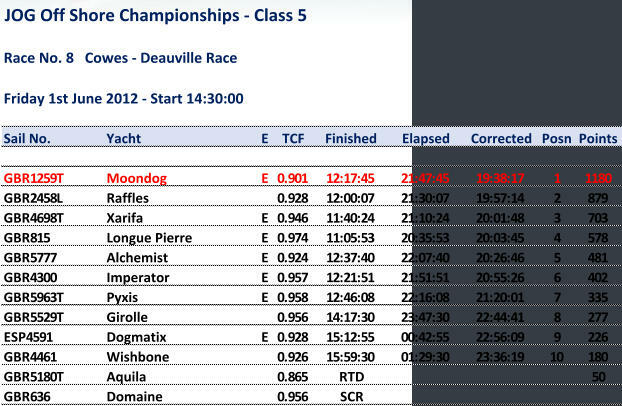 During the last hour we had been listening to yachts giving their finish times and knew we were in for a good finishing position and so it turned out with not only a win in class 5 JOG but also class 4 RORC and leading RORC double handed. Unfortunately, in choosing to anchor off Deauville and wait for the lock to open, we missed the prize giving but did receive two nice bits of silverware from RORC and champers from JOG and many much appreciated congratulations from fellow competitors. What were our keys to success on this race? We felt that our clean yacht bottom was vital as it always is, benefitting when the wind filled in on the Island side in the Solent and overnight in the light stuff we never sailed close hauled, mainly keeping sheets just eased to keep speed up as we were confident in the wind backing and doing the work for us to get back to the course we needed.